Houston Mayor Turner, City Council Members, and community members displaced by Harvey speaking at a City of Houston press conference. Months after Hurricane Harvey, Houstonians are still suffering. Over 5,000 people are not in their homes, some housed in hotels, others hopping between family or friends to ensure a roof over their heads. 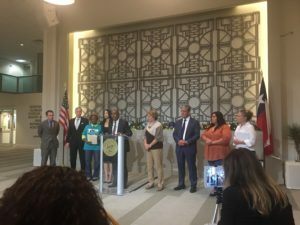 City of Houston urgently requests funding from the federal government to help the most vulnerable rebuild as well as to mitigate future flooding disasters. As the U.S. House approved $81 billion for hurricane relief today, Texans await for the U.S. Senate to follow in their footsteps to help support hurricane-ravaged Texas, Florida, and Puerto Rico. Yet this, according to Houston Mayor Sylvester Turner, is not enough. He called the reluctance to fully fund the $61 billion aid request from Texas a “formula for failure,” stating that the current proposal will not do enough to help those most vulnerable. In order for Houston to become a stronger and more resilient city, it needs strong support from the state and federal governments. Gov. Abbott’s request for $61 billion, which the House did not fully fund in their package, includes $12 billion for what’s known as the “Ike Dike.” The Ike Dike is a proposed barrier that would be constructed in order to reduce the impact of storm surge on the petrochemical plants and refineries that line Galveston Bay and the Houston Ship Channel. It would also include $466 million for the Port of Houston to “create resiliency” and harden the Houston Ship Channel. While a 20 foot storm surge would no doubt create untold ecological, environmental, and health crises, the real impetus behind the Ike Dike is to protect the assets of the petrochemical industry, and this is $12+ billion taxpayer-funded bailout. Public Citizen joins Center for Climate Integrity as part of a campaign called Who Pays for Harvey. Scientists have demonstrated that the rainfall and flooding from Harvey was made worse due to climate change-related effects. Furthermore, many of the major petrochemical companies that line the Houston Ship Channel have been aware of the impacts of climate change for decades, yet have actively funded denial campaigns to mislead the American public. Rather than another corporate bailout, government should hold corporations accountable for their role in climate change. Corporations should at the very least foot the bill for the infrastructure projects that serve to protect their assets, while leaving federal dollars to help the most vulnerable rebuild and put their lives back together.